Happy Sunday!! It’s 80 degrees, sunny with a slight breeze and absolutely beautiful here right now. I’m gonna go out on a limb and call this this most beautiful day we’ve had all summer, weather wise. Since I’d be a fool not to spend every spare moment outside, I just jumped on here quick to submit this post I wrote a couple weeks ago but didn’t get around to posting. Enjoy your day! Believe it or not, Madison, WI is a foodie’s paradise. I’m not sure if this statistic still holds true, but for years Madison had more restaurants per capita than any other city in the US. There is so much culture & diversity here and it shows in many ways, but especially in the food. Sure, we love our fried cheese curds & bratwursts, but take a walk down State Street & you’ll find a little bit of everything. Brazilian, Italian, Afghan, Ethiopian, Mediterranean, Mexican, and American. And that’s just on one, lovely street in a city full of lovely streets. 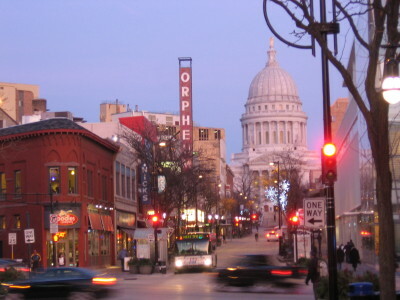 Twice a year, Madison Magazine holds Restaurant Week. Area restaurants participate by offering 3 or 4 three-course menu options for a set price of $15 for lunch or $25 for dinner. Much like Taste of Madison, I love the idea of trying a few different things from a new-to-me place without having to spend a bunch of cash. Last week, I took advantage of Restaurant Week twice. 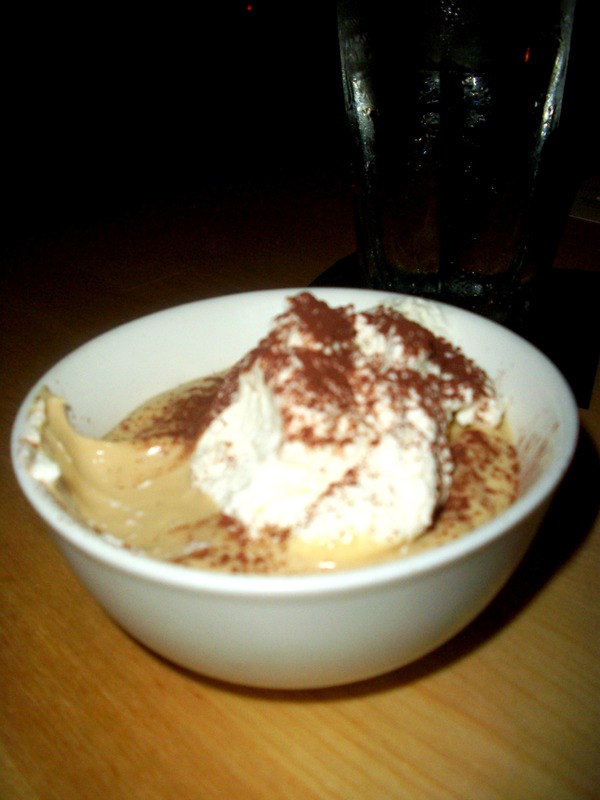 Wednesday evening, I visited Osteria Papavero with my friends Melissa & Holly. We didn’t take a picture together (fail) but you just saw them here. We sipped on drinks while waiting for our table. We had our choice of 3 items for our first course & we all chose differently. Note: The menu items for Restaurant Week are versions of items they offer on their menu, but not exactly so I’m not using the names as they were all in Italian & aren’t exactly the same on their menu online. A cold seafood pesto salad for me including shrimp, scallops, squid, octopus, red potatoes & some other indiscernable vegetables. 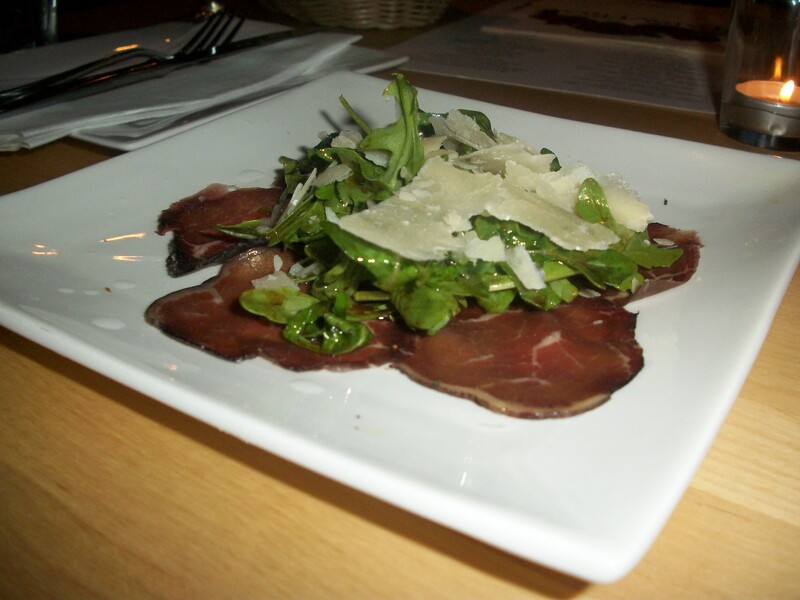 A salad with prosciutto for Holly. And an unpictured eggplant parmigiana dish for Melissa. It arrived much after mine & Holly’s so I was too busy digging in to photograph when hers finally arrived. My main course was a mushroom gnocchi, which was soft & pillowy & full of flavor, just the way gnochhi should be. Unfortunately, it did not photograph well. Even more unfortunate were the other girls’ main courses. If memory serves me, they had ravioli in a lobster cream sauce, but the raviolis were hard. 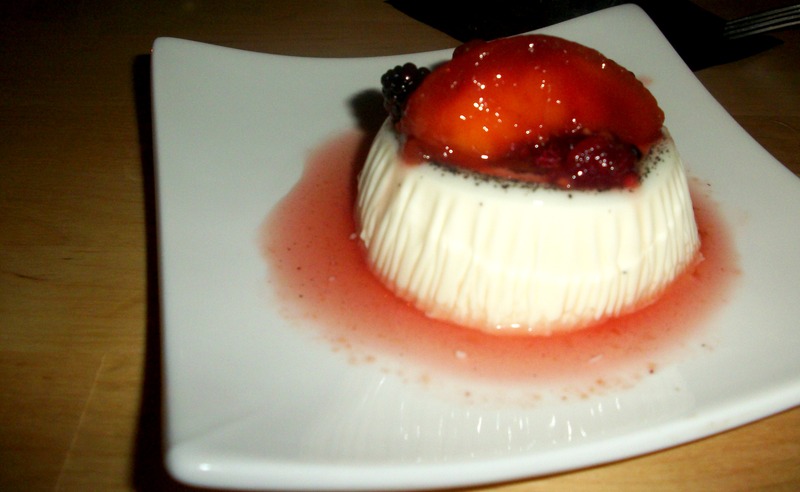 Dessert for me was a lemon panna cotta topped with fresh fruit, which was super light & refreshing. Butterscotch pudding for Melissa & Holly, which was also super tasty. The service was great (our server made one mistake but was apologetic & friendly, which made up for it), the food was mostly good & the drinks, while a bit pricey, were great as well. Of course, the company was better than any of it, but I could have fun with those girls eating at McDonald’s. I would probably return to Osteria Papavero if I were looking for a place to eat in the area, but I’m not dying to go back again right away. The very next evening, along with three other couples, Justin & I visited Liliana’s. Liliana’s has been open for at least 5 years & I drive by it every single day on my way to work, but this was my first time eating there. It’s owned & operated by a local family & is named after their daughter. 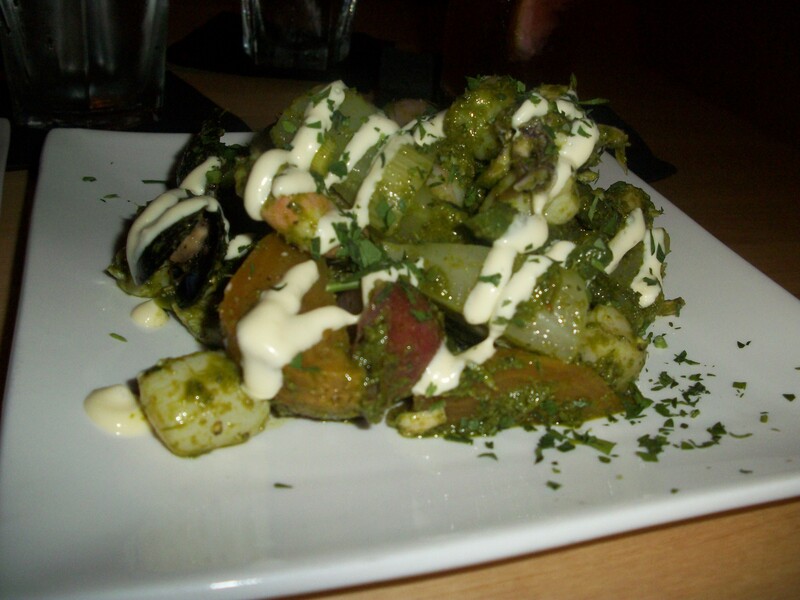 The menu is creole inspired, featuring many typical New Orleans dishes. Our table sampled a little bit of everything. Jalapeno cornbread, gumbo, jambalaya, blackened catfish, & red beans and rice. 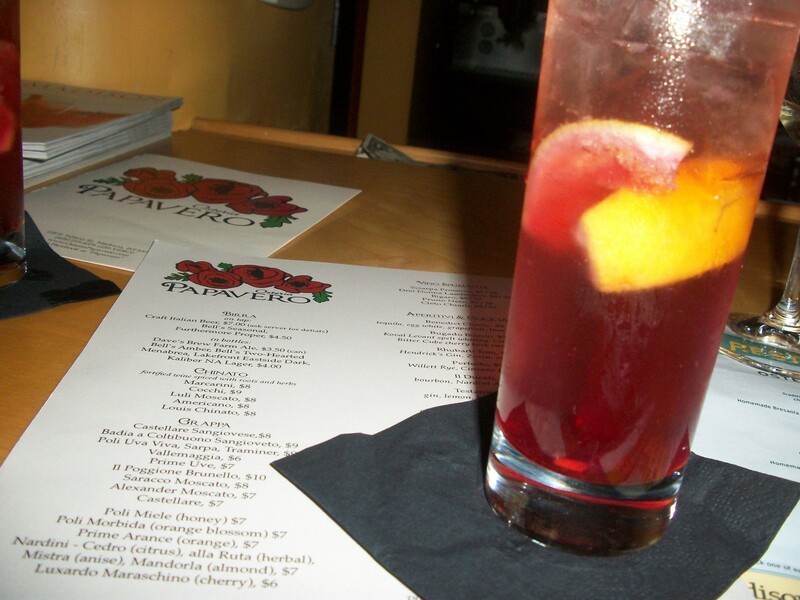 I also had a “Southern Sangria” or two, sweetened up with a hint of bourbon. Everything was fantastic. I didn’t take single picture. We were so busy chatting, eating & enjoying ourselves that it didn’t even occur to me to pull out my camera. You’ll just have to take my word for it when I say that the food is definitely worth trying. Without a doubt, we will be back. Do you have anything like Restaurant Week where you live? Even though I’ve lived in Madison for 8+ years, this was my first time participating in restaurant week and I’m so mad at myself for not taking full advantage of it in the past. It’s such a great way to try a new restaurant! They had one in Denver and I totally missed it. Darn! I know they are so fun! That seafood pesto salad looks amazing. We have downtown dining week in Milwaukee. It’s the same concept. I LOVE it!